New facilitators often receive little training and struggle to find their way. Seasoned facilitators often feel like their group’s just not going as well as it could or should. I know what it’s like to have a group that struggles to share, connect, and attend each week. I also know what it’s like to have a group that runs over weekly because they can’t stop sharing! God’s blessed me with some excellent training and more “learning opportunities” than I’d like to admit! I’ve pulled it all together in this online training to share with you. I’m sharing the best tips and techniques that I’ve gathered and gleaned from almost 20 years of attending and leading Bible studies. 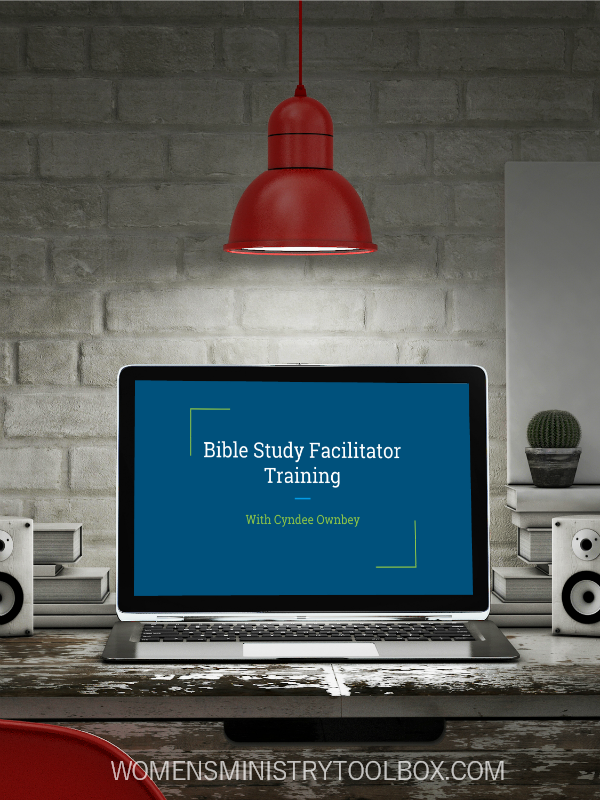 I want to help you craft a plan that’s going to allow you to be the best Bible study facilitator possible. We’ll look at the little things that can make a big difference in your group’s attendance and participation. The course is video-driven with accompanying worksheets. Bite-sized videos make it easy for you to digest and re-visit the content. Downloadable PDFs include forms and scripts that you can use or tweak to make your own. You can preview a sample of the course and view the entire curriculum here. This online course is open now and available for you to take at your own pace. Now through June 26, 2018, I’m offering Women’s Ministry Toolbox readers a special 20% discount. Click this link or enter the code: JUNE2018 to purchase the course at this special price. If you’d like to provide training for all of your small group or Bible study leaders, please contact me for bulk pricing options. I pray this will be a valuable resource for you and the women leading Bible studies and small groups in your church!